Looking ahead: Who's feeling the heat, and who's not, among Big Ten coaches? 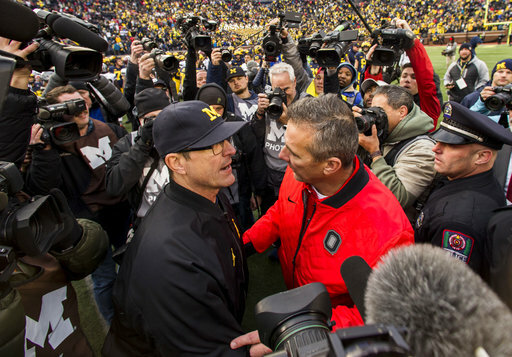 Who’s feeling the heat among Big Ten coaches? Urban Meyer, Ohio State: A 73-8 record in six seasons. A national title, two Big Ten crowns and a 49-6 mark in the past four years. These are good times to be a Buckeyes fan, and they can thank Meyer for that. He’ll be Ohio State’s coach for as long as he wants. Paul Chryst, Wisconsin: When last we saw Chryst on the sideline, he was muttering, “Turnover chain, my [uh, posterior]’’ as his Badgers beat Miami in the Orange Bowl to complete a 13-1 season. That was the understated Chryst showing his competitive side, and he enters the 2018 season with a team built to contend for the Big Ten title and maybe more. Pat Fitzgerald, Northwestern: Three times in the past six seasons, Fitzgerald’s Wildcats have won 10 games. This is at Northwestern, folks. James Franklin, Penn State: Back-to-back 11-win seasons, including a Big Ten championship in 2016, have Franklin sitting pretty in Happy Valley. The Nittany Lions return a veteran offense led by dynamic QB Trace McSorley, so another double-digit-win season is possible. Kirk Ferentz, Iowa: He’s been at Iowa since 1999, the longest-tenured active coach at any FBS school. Ferentz took the Hawkeyes to the 2015 Big Ten title game, and the schedule sets up nicely this year with Wisconsin visiting Iowa City, and Ohio State, Michigan and Michigan State not on the slate. Jim Harbaugh, Michigan: This is a show-me season for Harbaugh, who has a good but not great record of 28-11 in three years in Ann Arbor. He made $7 million last season, but his team finished fourth in the rugged Big Ten East. And the fact that he’s 0-3 against Ohio State doesn’t help his cause. The Wolverines return the talent to win big; now they just have to do it. Mark Dantonio, Michigan State: The Spartans rebounded nicely from the uncharacteristic 3-9 mark in 2016 to go 10-3 last year, and they should be in the hunt for a Big Ten East title again. The issue in East Lansing, however, is turmoil surrounding the school’s administration and athletic department following the Larry Nassar scandal. Scott Frost, Nebraska: Cornhuskers fans welcomed Frost like a conquering hero when the former Nebraska QB returned to Lincoln to right the ship after leading Central Florida to an unbeaten season. He’ll get time to turn things around. Jeff Brohm, Purdue: The Boilermakers improved from 3-9 to 7-6 with a bowl win in Brohm’s first season in West Lafayette. Tennessee came calling after the season, and Brohm later received a two-year contract extension at Purdue. P.J. Fleck, Gophers: No, Fleck’s 5-7 record in his Minnesota debut didn’t wow the Gophers faithful, but athletic director Mark Coyle approves of the direction the program is going and gave the coach a one-year extension in November. Fleck is winning on the recruiting trail. Eventually, that must result in victories on the field. Tom Allen, Indiana: The Hoosiers were 5-7 in Allen’s debut last year. He will get time to improve on that mark, but it won’t be easy in the Big Ten East. Chris Ash, Rutgers: The Scarlet Knights had a mini-breakthrough last year in Ash’s second season, ending a 16-game Big Ten skid and winning three conference games in a four-game stretch. Though Rutgers finished 4-8, Ash has the program pointed in the right direction. DJ Durkin, Maryland: The Terrapins dropped from 6-7 to 4-8 in Durkin’s second year, and much of that can be blamed on a slew of quarterback injuries. A return to health and the promise of solid recruiting classes provide optimism. Lovie Smith, Illinois: The Illini went 3-9 and 2-10 in Smith’s first two seasons. Smith better hope all those freshmen forced into the lineup last year mature quickly. If not, this could be his last season in Champaign.